The Football Association's process to appoint the next England manager has been defended by former FA executive Adrian Bevington after Gareth Southgate had a three-hour interview on Monday. Southgate, 46, was in charge for four games as interim manager and is the only candidate. Ex-England striker Chris Sutton criticised the FA and said it was a "slap across the face" for Southgate. But Bevington said: "Personally, I don't think it is overcomplicating it." 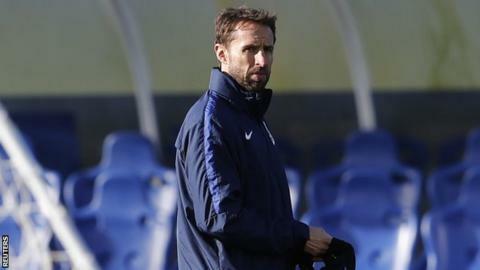 England Under-21 coach Southgate was interviewed by a five-person panel on Monday but no announcement is expected until any appointment is ratified at a full FA board meeting at the end of the month. England won two World Cup qualifiers - 2-0 against Malta and 3-0 against Scotland - and drew another 0-0 away to Slovenia during Southgate's short stint in charge. "Why make this meeting public?" Sutton told BBC Radio 5 live. "Why couldn't they have had this meeting behind closed doors and then announced Gareth as manager? "It's a little bit undermining, a bit of a slap across the face." Bevington defended the process, adding: "I understand why there's the debate about why you need a formal process. "It makes perfect sense if you've had an interim manager to have three or four days pass and then come back and review it with a clear head. "I think Gareth's a pretty measured individual and getting back to the point of why it's in the public domain, those people around the table would have preferred for that not to be in the public domain."